I read last week of the death of ex-Sony chief Norio Ohga, the ‘father of the CD’. When Sony launched the CD format in 1982, Mr Ohga insisted that a disc must be long enough to contain his favourite piece, Beethoven’s Ninth Symphony. This determined the 75-minute length of the new CD format. I vividly remember the impact that the new format had on us musicians. I and my colleagues had started by recording on LP – two sides of about 25 minutes each, enough to record two substantial works of several movements each. When the CD format came along, however, record buyers started to expect 75 minutes of music. Soon it was considered ‘not value for money’ if a CD offered much less than this. For us, this meant that two works were no longer enough – we were now expected to record three. This, of course, meant more preparation, more pressure in the recording studio, more challenges to our stamina, concentration and temper. Personally I’d always found it more than enough to tackle two complete works for a disc. Now we had to do three, or whatever amounted to 70-75 minutes of music. The recollection is relevant to the Florestan Trio’s new disc, just out on Hyperion. 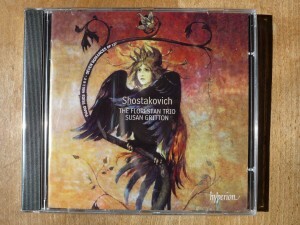 We planned to record just Shostakovich’s Second Piano Trio, and the Seven Songs of Alexander Blok for soprano and trio (with Susan Gritton), two works we felt were musically intense enough to stand on their own. But when it was found that the our performances totalled 55 minutes, we were asked to go back into the studio and record the First Trio as well, so that the disc would jump over the magic 60-minute mark and become ‘value for money’. We did, and the result is just arriving in the shops. Early reviews have been lovely. This entry was posted on Monday 2nd May 2011 at 12:05am	and is filed under Concerts, Florestan Trio, Musings, Reviews. You can leave a response, or trackback from your own site.